Migrelief-now is a non-prescription nutritional supplement recommended by healthcare professionals. It provides fast acting nutritional support to migraine and headache sufferers when they need it most, now. Not just for migraines and headaches, migrelief-now is truly a powerful force for promoting wellness and comfort in your body. Migrelief-now is to be taken "as needed" for fast acting cerebrovascular support during challenging times. Safe for men, women and children over the age of 12, now may be used by itself or combined with any other migrelief formula as needed or daily for additional nutritional benefits. Half of the adult dose can be used by children 2-9 years of age. Now contains magnesium (citrate and oxide), puracol feverfew, a proprietary combination of whole leaf feverfew containing a broad spectrum of naturally occurring phytochemicals and a unique feverfew leaf extract, cerevasc ginger, a proprietary combination of ginger rhizome powder and standardized ginger extract and aflapin boswellia serrata. These ingredients have been shown in human clinical studies to have numerous health benefits including benefits for migraine and headache sufferers. 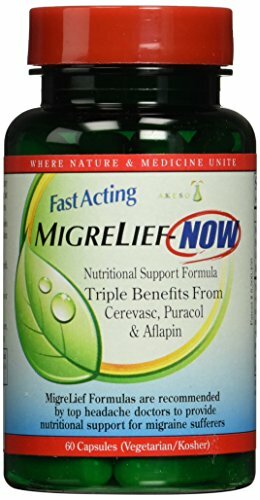 Migrelief-now conveniently combines all four of these ingredients into one formula at the dosages the clinical studies show to be most beneficial. So, with "now" you need only one product instead of 4 separate products. View More In Alternative Remedies. If you have any questions about this product by MigreLief, contact us by completing and submitting the form below. If you are looking for a specif part number, please include it with your message. Aleve Direct Therapy TENS Device Value Pack (1 Device + 2 Pairs of Refill Gel Pads), Drug-Free, Wireless TENS Technology, Relieves Lower Back Aches & Pains from Exercise, Household, Work Activities. #1 Pure Corydalis Natural Pain Relief by Parker Naturals 10:1 Extract 1,000 Mg. Per Serving, Strongest on Amazon, 120 Premium Corydalis, Highest Quality on the Market! 100% Money Back Guarantee!